Earlier today, one of my friends posted a blog about the top 5 Vietnamese dishes she wants to try on her 8 months academic placement. Naturally, we both share the love of food (more specifically, the dumplings at Grace & Healthy Dumplings in Waterloo) so I decided to create a Sri Lankan edition. Recently I got asked what types of food I’ll be seeing in Sri Lanka. My response? The most stereotypical (and potentially wrong) answer: “Oh you know, curry and stuff”. It’s time for me to right my wrongs and do a little bit of research. I present to you 9 staple dishes and drinks of Sri Lanka that I am very, very excited to try. 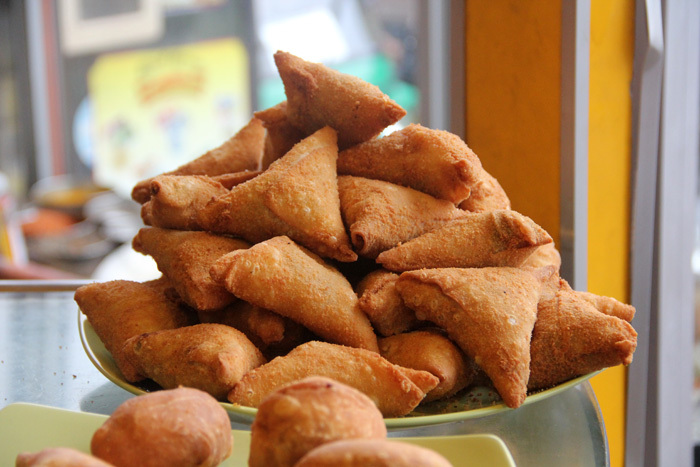 I love samosas. I can’t wait to try Sri Lankan samosas. I’m so excited. 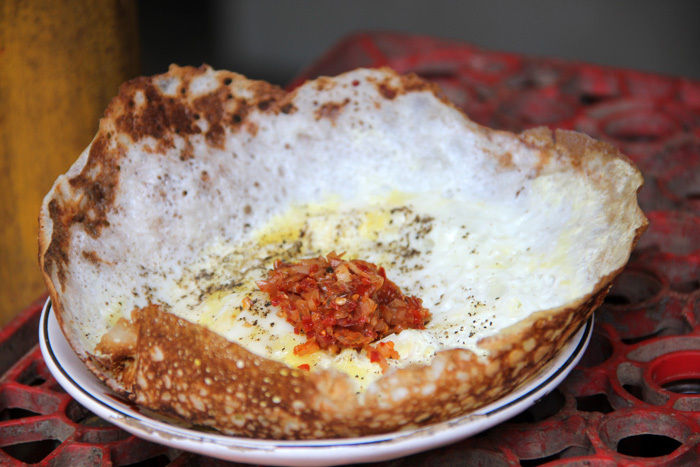 Appam (egg hopper) is an iconic Sri Lankan breakfast or dinner food made with fermented rice batter and coconut milk. I’m pretty sure my taste buds haven’t experienced anything of this nature so I’m excited to have my first bite! Kottu is a popular Sri Lankan stir fry dish with shredded pieces of godamba roti (oily fried piece of thin dough), spices, and your choice of egg, cheese, vegetables, or meat. According to Sri Lankan foodies, kottu roti is comparable to the hamburger – it’s tasty, impossible to resist, and always available. (I think I might have to limit myself to only 1 kottu a week). Check out this video and get ready to be hungry! Up until today, I’ve never heard of wood apple. It’s hard exterior is similar to a coconut and the interior looks something like a giant raisin. One blogger describes it as this: “the outer shell smells a bit like rotting blue cheese mixed with dirty socks. The inside of the fruit looks a bit like diarrhea, but tastes similar to a tamarind”. Check out more here. What better way to cool down from the Sri Lankan sun and humidity than with a king coconut? At the Kitchener/Waterloo Multicultural festival, I ended up paying a whopping $12 for fresh coconut. A little steep in my opinion. In Sri Lanka, these bad boys cost 30-40 LKR ($0.30-$0.40 CAD). 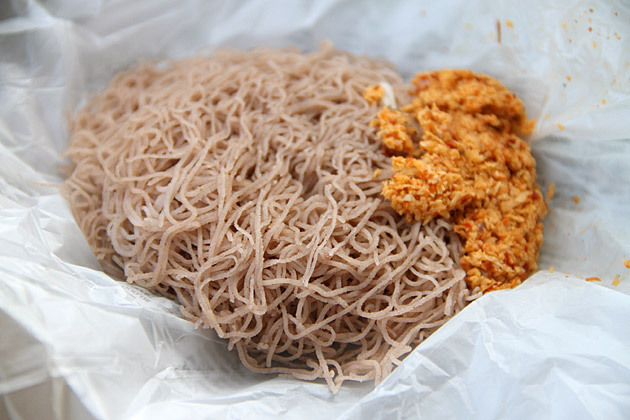 String hoppers are rice-flour noodles that are formed to make a “noodle pancake”. Toss in some coconut curry gravy and it’s ready to go! I grew up eating some interesting (and often times, questionable) Chinese dishes so seeing these shrimps together in a fritter isn’t disgusting – it looks delicious! Coconut arrack and ginger beer: I imagine it to be delicious. What is arrack? Arrack is a Sri Lankan spirit, distilled from naturally-fermented nectar of coconut flowers. People say that it’s a must try with Elephant Ginger Beer…so I must try! I hope to try new things when I move to Sri Lanka for 8 months in September. As long as there isn’t cilantro, sheep eyeballs (that’s another story), dogs/cats, or gizzards, it’s fair game. 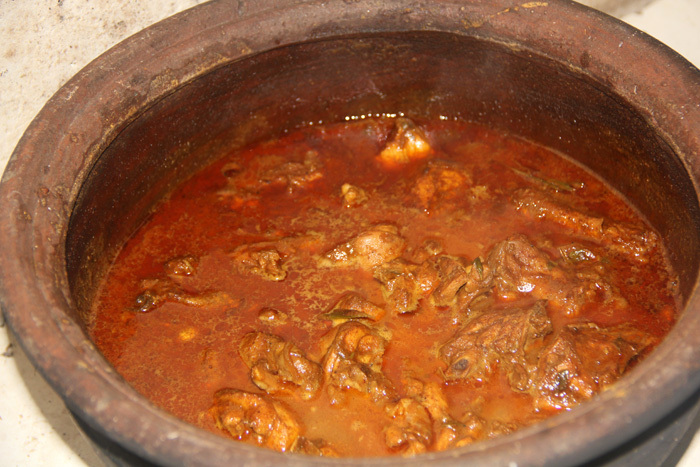 Know of any good places to eat in Sri Lanka? Comment below!